As the remaining cool of winter gives way to brisk spring, families are gearing up for those few weeks of spring break that have them loading up their minivans and SUVs and heading toward the water. However, if the coast of Florida or the sunshine of the California coast is just too far to travel for spring break, Michigan's resort city Boyne Falls might just offer enough warm water with its 88,000-square-foot indoor water park - Avalanche Bay. 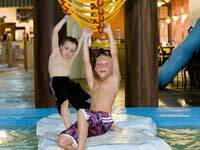 Located at the Northern Michigan resort Boyne Mountain in Boyne Falls, Avalanche Bay is the state's largest indoor water park, offering food, fun and water in its fully-enclosed, 84-degree play area. Carefully tucked inside Boyne Mountain's expansive Mountain Grand Lodge and Spa, Avalanche Bay gives families an water-friendly travel option, even during those cool spring days when the water temperatures outside run chilly. Avalanche Bay closely mirrors the Swiss-Austrian design of its accompanying Mountain Grand Lodge, complete with artificial, snow-covered mountain tops and cozy eateries. Featuring a variety of water-related activities for all ages, Avalanche Bay gives families of all varieties a multitude of options. From the relaxing Boyne River and Glacier Hot Springs where visitors can leisurely enjoy both warm and cool water temperatures, to the Super G and Rip Zone where more adventurous visitors can experience the best in water excitement - Avalanche Bay gives both children and adults hours of summertime fun all year long. After taking the young ones into the kiddy pool, or watching teens attempt indoor surfing at the Rip Zone, parents can gather the family for some food at Avalanche's two eateries - the Snack Shack and Après Ski Pub. For a more adult-friendly afternoon snack, the Après Ski Pub also serves alcoholic beverages in its more sport-bar atmosphere. A day of water park fun - which typically runs from 9 a.m. to 10 p.m. and costs between $19-30 - kids can hit the game-filled arcade, located inside the Mountain Grand Lodge near Avalanche Bay. The arcade features old gaming favorites such as Skeeball and Ms. Pacman, which both parents and kids are sure to enjoy. Visiting this family-friendly water park is made simple with the 220-luxury rooms inside the Mountain Grand Lodge and Spa. 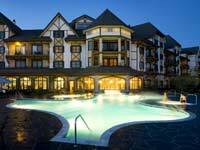 The 4-star resort, though accommodating enough for a romantic weekend away, also adds great children friendly touches including and indoor/outdoor pool and outdoor hot tubs - which are a fantastic way to enjoy the winter wonderland of Boyne without catching a chill. Each room and suite comes with a ready-to-use dinning area and kitchen, complete with a coffee maker, usage refrigerator, microwave, dishes and utensils. 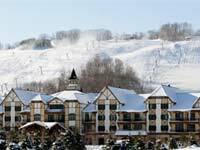 Sitting adjacent to the Boyne Mountain slope, the Mountain Grand Lodge is a great place for families who not only want to enjoy Avalanche, but also the resorts grand ski slopes, restaurants and nightlife. For an enjoyable family dinner, or romantic late night snack, visitors can grab a bite to eat at Everett's Restaurant and Lounge or Das Café, both located inside the Grand Lodge. However, those looking for more eating options can venture outside the lodge to a variety of eateries including Pierson's, Eriksen's or even the Trophy Room. The more than half a dozen restaurants and pubs give Avalanche visitors choices for all palettes. Parents wanting to sneak away for a more adult-friendly afternoon can take advantage of Avalanche Bay's Play Care, where educational supervisors can keep children busy with cognitive, yet fun activities while mom and dad run off to play. The water park also offers Fritz and Friends Kids Camp for children ages 6-12, a weekend camp where kids can enjoy water activities, create crafts and more. During these kids-friendly events, parents can head to the Solace Spa, a premiere spa located inside the Mountain Grand Lodge. Follow a day of fun at Avalanche Bay and a quaint dinner, families can gather together for one of the many evening events held at the Lodge including weekend movies, horse-drawn sleigh rides and hot coca-inspired bonfires. Families looking for that next great spring break location, when the temperatures are still slightly chilly, can head into Boyne Falls, Mich. and enjoy a bit of summer indoors at Avalanche.